In Your Land is an experimental documentary installation that explores the relationship between native NYC bird species and their immediate urban environment. Filmed across a handful of days in Jamaica Bay, Governors Island, Central Park, and Prospect Park, it aims to subvert perceptions of urban wildlife as merely peripheral/incidental by depicting the diverse and thriving ecology that pervades the city. The piece consists of two video panels and a stereo audio environment, independently looping in separate intervals to procedurally create unique juxtapositions between its components. A companion app installed on tablets adjacent to both panels provides visitors with the opportunity to explore different bird species as they appear on screen. Photographed and edited by Jeff Mertz. Score composed, recorded and mixed by Finnegan Shanahan. Score performed by Finnegan Shanahan (guitar/vocals), Robby Bowen (percussion/vocals), and Jeff Mertz (vocals). Companion app designed and programmed by Paul Hine. 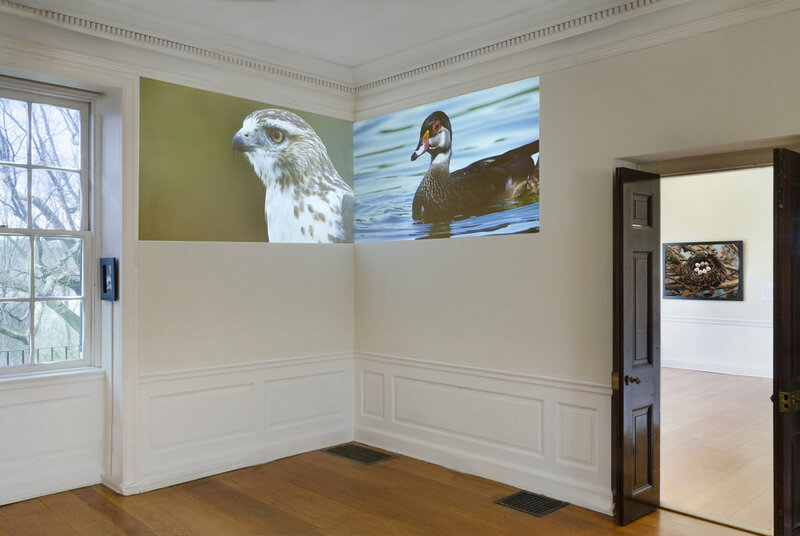 This work was produced in association with the NYC Audubon's 2017 summer artist residency on Governors Island, and later commissioned for the group show Avifauna at Wave Hill, April-June 2018. In Your Land installed at Wave Hill, NYC, April-June 2018. Background image by Nina Katchadourian.